Friederike Fabritius is a neuropsychologist and a leading expert in the field of Neuroleadership. As an executive coach and leadership specialist, she has extensive expertise working with top executives from Fortune 500 companies. A sought-after keynote speaker, she has addressed large audiences at events hosted by prominent multinational corporations, including EY (Ernst & Young), thyssenkrupp, Trivago, and Audi. Hans W. Hagemann, Ph.D., is managing partner/co-founder at the global leadership consultancy firm Munich Leadership Group, which counts Allianz Global Investors, Bayer, BMW, EY, Expedia, Montblanc, SAP, Siemens, and thyssenkrupp among their clients. He is a global expert on leadership and innovation who has led seminars, coaching sessions and in-depth workshops with top executives in more than 40 countries. "The Leading Brain is the best integration of neuroscience and leadership that I have ever seen." "Combines neuroscience and leadership in a way that is both highly informative and fun. 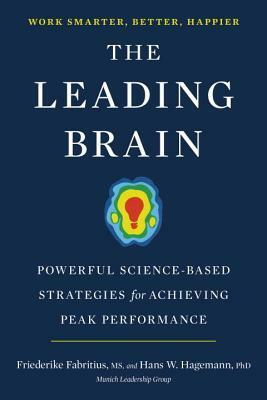 The Leading Brain covers a vast array of fascinating topics, such as habit formation, emotional regulation, intuition, and optimal decision making. There are tons of useful strategies in this book that you can apply to your life and your work right away!" "Really enjoyable and informative. Covers much of what I teach my students, that they must take command of their own psychological machinery to be successful in any endeavor. I hope to incorporate many of the lessons in my lectures and recommend the book to my students." "The Leading Brain is as insightful as it is accessible. In teaching us how our brain works, we are in the advantageous position of making our brains work better. This book is a must read for anyone who is a leader, will be a leader or even for those being led." "Concrete, energetic, and accessible, this is a must-read for anyone who takes a science-backed approach to business."